2012 will see the release of a film I’ve been anticipating for over a quarter of a century. Directed by Pixar regular Andrew Stanton, and with a screenplay by Michael Chabon, John Carter of Mars is not the first attempt to film Edgar Rice Burroughs’ Martian novels – it’s not even the first to make it into production – but it does stand a chance of being the first to fully realise Burroughs’ world the way it looked in my head when I was 12. Burroughs has always been best known for the creation of Tarzan, partly due to that character’s popularity in other media. However, few of the many films to have featured the Lord of the Jungle are particularly faithful to the tone or detail of the novels. Tarzan’s Africa is a land packed with mysterious lost cities, tribes of great apes previously unknown to science (one group of which, the Mangani, are the creatures who raise Tarzan); it bears about as much resemblance to the real Africa as it does to Wigan. The Tarzan films generally preferred to stick to a mix of hostile natives, evil hunters and the occasional bit of alligator wrestling. (The version closest to the books was actually the cheaply animated Filmation cartoon series of the 70s.) Hugh Hudson’s 1984 Greystoke also changes things but goes to a different extreme, treating the source novel with the kind of respect usually retained for great literature. Burroughs could certainly spin a yarn, but great literature he wasn’t, nor would he claim to be. Though I read some of the Tarzan novels as a boy, it was the adventures of John Carter, the Virginian gentleman and adventurer transported to an alien world, that really hooked me. 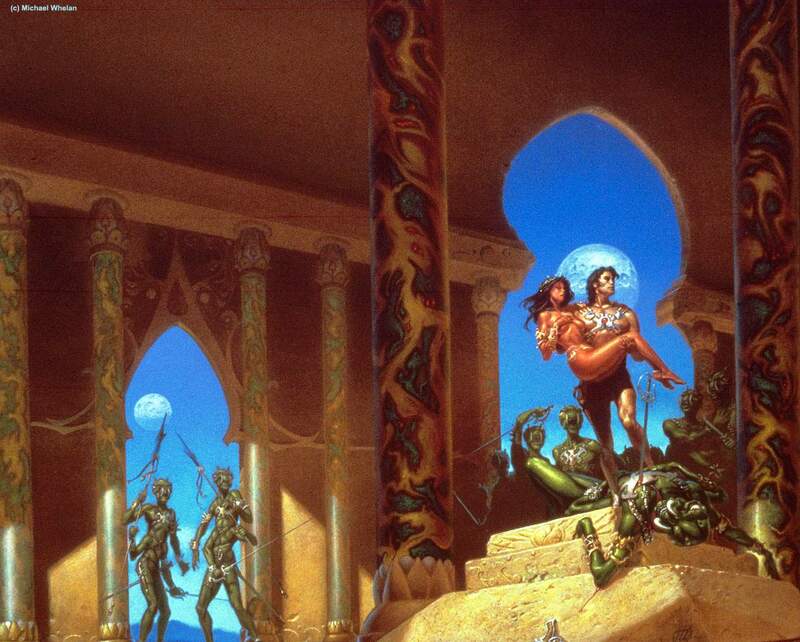 When I was 12, the books were available in editions with colourful, exciting cover paintings by Michael Whelan that accurately reflected the contents – the Whelan cover for the first novel, “Princess of Mars” heads up this piece. That novel, originally called “Under the Moons of Mars” and published in 1912, tells of how the former Civil War soldier turned gold prospector John Carter (presented as a great uncle of Burroughs) is transported to Mars (known to its inhabitants as Barsoom). Hiding in a cave from a group of murderous Apaches who have already killed his prospecting partner, Carter is incapacitated by a strange smoke. He undergoes an out of body experience that transports him to a world he instinctively recognises as Mars, a world that ‘for [him], the fighting man, had always held the power of irresistible enchantment’. Here, Carter soon encounters the Tharks, a ferocious tribe of four-armed, tusked green men. His martial prowess wins their respect (the lower gravity of Mars gives him the handy ability to leap incredible distances) and he is partially accepted into their society. Shortly afterwards, the Tharks overwhelm a passing ship from the city of Helium and capture that city’s princess, the incomparable Dejah Thoris. Naturally, she and our hero are soon in love. The rest of the plot involves a series of escapes, chases and battles as Carter faces the forces of the rival city of Zodanga, who have become the latest people to capture Dejah Thoris. Attempts to get the adventures of John Carter to the screen go back decades. Cheapshit chancers The Asylum last year released a straight to DVD adaptation, Princess of Mars, starring Traci Lords as the title character. Personally, I would have liked to see the version that Jim Henson was reportedly involved in; his work, as seen in 80s classics like The Dark Crystal, would have had a solidity that even the best CGI creations often lack. But perhaps it’s only now that special effects are genuinely up to the task of visualising Burroughs’ remarkable world; a dying planet of warring races that range from the noble red people with whom Carter allies himself, to savage, multi-limbed green men, as well as a multitude of bizarre beasts. The book offers certain challenges for any adaptor. Re-reading “Princess” in preparation for this piece, I was taken aback by how poor some of it is. Burroughs supposedly decided to start writing on reading contemporary pulp fiction and deciding that anything he came up with had to be better. Sometimes this shows. Carter narrates every event in precisely the same matter of fact tone: whether he is taking a stroll around a ruined city, facing a horde of bloodthirsty adversaries, or staring at his own apparently dead body in an Arizona cave, he rarely rises above a tone of mild bemusement. On other occasions, he glosses over apparently major fight scenes in the manner of someone who has reached his word count for the day. Narrative structure is also something that Burroughs felt could be safely left to other writers. Like much of his work, “Princess” has a ramshackle, made up on the hoof quality. Given that many of his novels were originally serialised in magazines, this may often have been the case; hence the need for the heroine to be kidnapped on a regular basis. Indeed one of the Martian novels I remember most fondly, “Swords of Mars”, essentially changes plot half way through, as though Burroughs had decided his initial idea just wasn’t working out. “Princess” offers another challenge to producers hoping to launch a new franchise, in that it was written as a stand alone novel, and only subsequently became part one of a series (the next two books, “The Gods of Mars” and “The Warlord of Mars”, ultimately form a trilogy). Consequently, Princess ends with a coda that sees Carter attempting to repair a damaged Barsoomian atmosphere plant, an attempt which sends him back to Earth in a manner as unexplained as the way he had arrived. So I’m ready to forgive Stanton and screenwriter Michael Chabon for taking liberties with the plot. What matters more to me is that they capture the atmosphere of the books. Some of that atmosphere stems from the time in which they were written, and it’s a relief that Disney (unlike the Asylum) have apparently resisted making Carter a modern day hero. Some of Burroughs’ writing has inevitably dated (when extolling Carter’s virtues in the forward, we are told that ‘our slaves fairly worshipped the ground on which he trod’), but his fantasy world grew out of his era’s preoccupations and beliefs. Not only was he influenced by other writers of the period – the most frequently cited is Edwin Arnold’s “Gullivar of Mars” – but his Barsoom draws on the theories of contemporary astronomers like Percival Lowell that Mars could be inhabited, now or in the past, due to what appeared to be a network of canals across its surface. By the time of the final Carter story, “Skeleton Men of Jupiter”, this theory had fallen into disrepute. Burroughs was reluctant to let a little thing like that stand in the way of his fiction, having Carter tell the reader: ‘Long ago, I believed with Flammarion that Mars was habitable and inhabited; then a newer and more reputable school of scientists convinced me that it was neither. Without losing hope, I was yet forced to believe them until I came to Mars to live… Unquestionably, the scientists appear to be correct in theory. Equally incontrovertible is it that I am correct in fact.’ There’s no arguing with logic like that. Passages like this made me worry, a few years ago, that a faithful adaptation would feel too old fashioned for current audiences. The success of Avatar changed my mind. Cameron’s Pandora is indebted to the whole history of science fiction – more specifically, it seemed to me, the history of science fiction illustration – and with its colourful alien tribes, creatures and ecology, it’s clear that there’s a healthy strand of Barsoom in its DNA. Avatar shows a commitment to worldbuilding that Burroughs shared, dodgy science and all, and it’s something the film should follow with. That’s not to say Burroughs didn’t occasionally play at satirising Earth traits. One thing that sailed over my head when first reading the books was an apparent attempt to compare the green warriors with communists. In chapter 10, Dejah Thoris describes them as ‘the victim of eons of the horrible community idea. Owning everything in common, even to your women and children, has resulted in you owning nothing in common.’ The writer’s sceptical attitude toward organised religion comes to the fore in “The Gods of Mars”, which reveals the Barsoomian afterlife to be a gigantic fraud perpetrated by a tribe of cannibals. 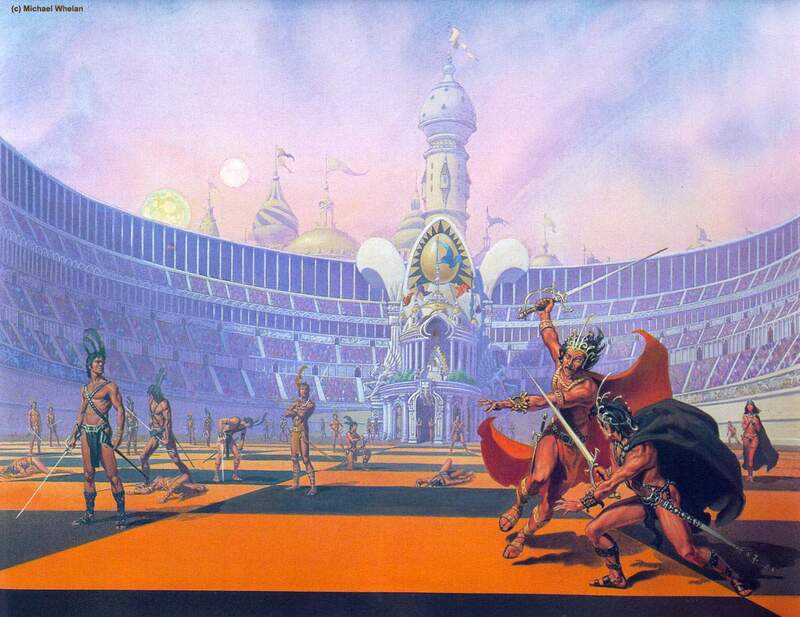 One aspect of his work which may have more relevance to a 21st century audience is that Barsoom is presented as a dying world. The variously coloured races have devolved from a single race, who ruled the planet peacefully in past eras; their crumbling cities are now inhabited by the green tribes. The world consists of a number of different tribes endlessly battling each other for control of scarce resources, using their technology in an attempt to prolong their existence. Whether Burroughs, writing two years before the outbreak of World War I, intended to draw any parallels with contemporary Earth society is a moot point, but it will be interesting to see whether Stanton and his colleagues make anything of it. Like most films, John Carter of Mars is intended as the first in a series. I really hope it works. There are many scenes from later books that I would love to see on screen: the plant men of “The Gods of Mars”, and most of all, the living game of Martian chess played out between duelling warriors in “The Chessmen of Mars” – my favourite of the series. If that’s going to happen, the film needs to address the weaknesses of the novel without losing the elements that make certain scenes still live vividly in my memory. I’m not concerned if details of the plot or characters change; that’s how adaptations work, and I suspect today’s moviegoers will want a better (or better sounding) explanation for interplanetary travel than astral projection. What’s important is that the film retains the colour and vibrancy of Burroughs’ Barsoom, and allows it to reflect something of the age in which it was written. Then it has a chance of matching the film that played out in my head when I was 12. I feel the same longing for a good, serious-minded attempt at adapting Harry Harrison’s Stainless Steel Rat books. Pulp fun, but with a respect for the source, and an understanding of what makes such broad stuff tick. I hope you get your wish! I haven’t read the most recent comics – I only discovered they existed while googling the film the other week – but I’m currently reading the Dark Horse collection of the late 70s Marvel series (Warlord of Mars). The earlier DC series (republished as Weird Worlds) starts off as a fairly straight adaptation of the books, but then starts rewriting and truncating bits, which is rather unsatisfying. The Marvel series is set in the period at the end of Princess of Mars, and is a pretty good attempt at merging the style of the books with the Mighty Marvel Manner (and that’s a phrase I never thought I’d type). I entirely agree about the Sainless Steel Rat books – Soderberg/Clooney should make them.